A college’s affiliations with other institutions of repute stands as a testimony to the authority and credibilityof that institute. So has International Institute of Management and Technical Studies proved its significant standing through its associations with top-notch institutions. 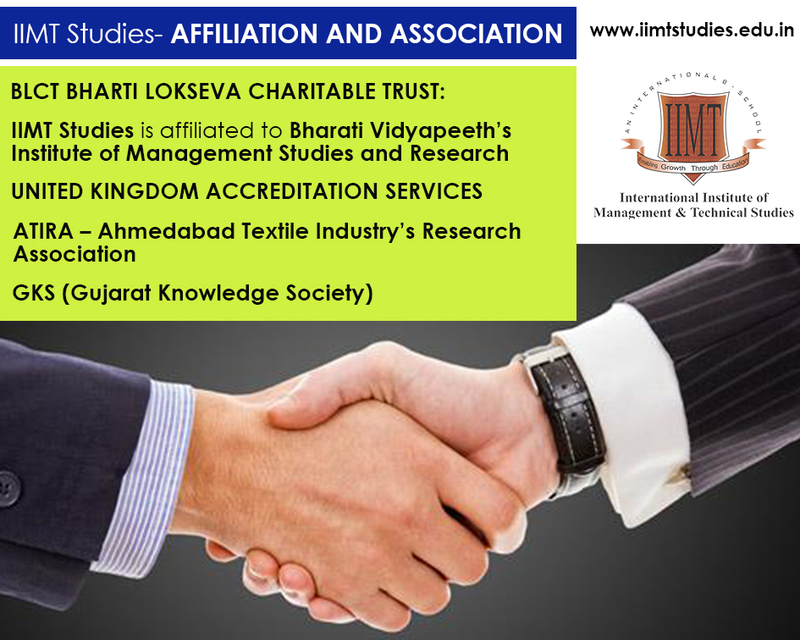 IIMT Studies Ahmedabad is a leading institute for E-learning and Distance Education curriculums and its affiliations with the following institutes has backed people’s trust in IIMT Studies. Bharti Lokseva Charitable Trust, established & registered under B.P.T. (Act XXIX of 1950) act of Government of India, is a non government, not for-profit organization registered to enhance the management skills of students. 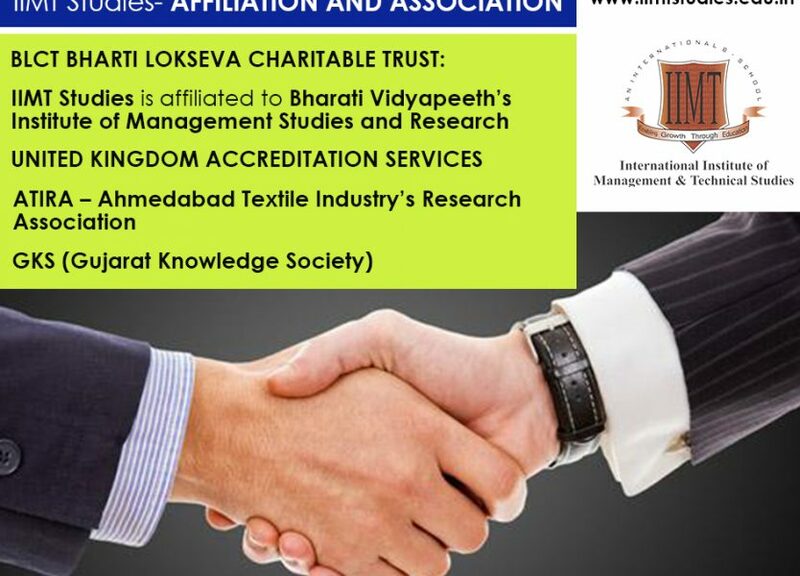 International Institute of Management and Technical Studies, Gujarat is affiliated with Bharati Vidyapeeth’s Institute of Management Studies and Research, Navi Mumbai, India. Approved by All India Council for Technical Education- AICTE, New Delhi, it is successfully running the courses with Bharati Vidyapeeth Deemed University, India. UKAS is the sole national accreditation body in the UK by statutory instrument (No 3155/2009) and operates under a Memorandum of Understanding (MoU) between the Secretary of State for Business Innovation and Skills and UKAS. Established in 1954, ATIRA is situated close to many prominent research and educational institutions like Indian Institute of Management Ahmedabad, Physical Research Laboratory and Gujarat University. It has a 2,72,000-square-metre campus which has a plant coverage of over 1,000 trees. Commissioner of Technical Education is the CEO of GKS and has initiated the implementation of Choice Based Credit System in all engineering institutions. The GKS Courses are recognized as elective courses by the SPFU and will be offered to the students from commencing term. The students opting for these courses will be engaged by the GKS training partners, for which they have to be provided with the space where they will register and conduct the classes for these courses. EADL is to represent all privately-owned and non-governmental European organisations offering high quality and educationally sound distance learning. EADL aims to improve the quality and acceptance of distance learning to ensure the maximum benefit for students. EADL provides its members with a forum for open discussion of all issues related to distance learning and for sharing ideas and good practice. The Directorate of Employment & Training (DET), Gujarat in Ministry of Labour is the apex organisation for development and coordination at National level for the programmes relating to vocational training including Women’s Vocational Training and Employment Services. Institute singed MoU for Virtual classes offering to all Government and Pvt. Industrial Training Institutes where expert faculties will transform their knowledge on Government plateform. 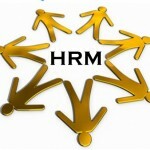 Thir Employment service is operated through a countrywide network of Employment Exchanges. IIMT has taken place as a first preference of professionals for correspondence course in different fields like management and engineering. Well, I must be thankful to all staff members and faculties who have made such success possible in such a short span of time. There is a small funda of getting success is Quantity before Quality. IIMT and its staff members have proven it erroneous and believed in Quality with Quantity. All associates and links are absolutely fair towards their attitude. 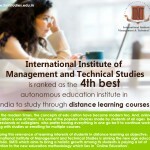 I think IIMT is a special place to learn in Distance Learning. Institute is committed to educate proficient men and women to help them develop a high level of professional knowledge through its certificate courses. The Distance learning Management Programmes will enable them to build up the knowledge, imminent and skills that need to make them effective leaders. IIMT Studies has successfully delivered the quality amalgamating with quantity to a huge number of people in more than 30 cities and approximately 16 countries so far and leading on their way to enrich more minds every day. 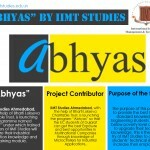 I m glad i got a my graduation degree from IIMT Studies which has valid affiliations.